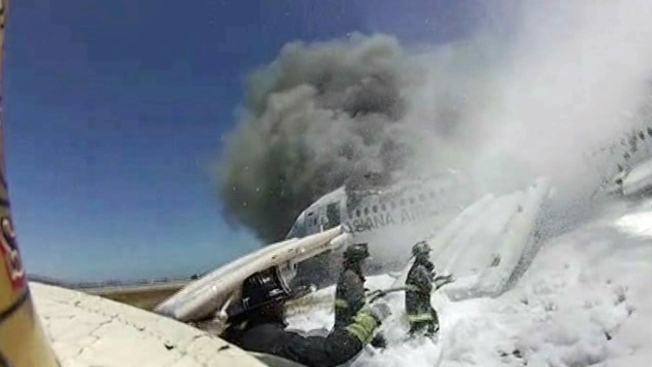 More than 180 passengers were injured in the crash of Asiana Airlines flight 214. A new lawsuit involving the crash of Asiana Flight 214 has been filed in Federal Court in San Francisco. In July 2014, a Boeing 777 owned Asiana Airlines flight crash landed on final approach to San Francisco International Airport. More than 180 people were injured and three died. Instead of naming Asiana Airlines as a lawsuit filed in South Korea recently did, this lawsuit names Boeing as the defendant. The suit points to a flaw in the Boeing 777’s automatic pilot system called the "FLCH" trap. The flaw was first exposed by NBC Bay Area’s Investigative Unit a month after Asiana Flight 214 crashed while landing at SFO in 2013. Experts say the "FLCH" trap occurs when the plane's auto-pilot system misleads pilots into thinking the auto-throttle is functioning when in fact the engines are idle. The plane can drop below the critical airspeed and altitude necessary to safely land. The suit was filed on behalf of two Korean survivors who were injured in the accident. In its legal response to the suit, Boeing denied the allegations, saying the company was not negligent or at fault in any way. Boeing further says it was the Asiana flight crew who failed to monitor and maintain proper airspeed and altitude during the landing.